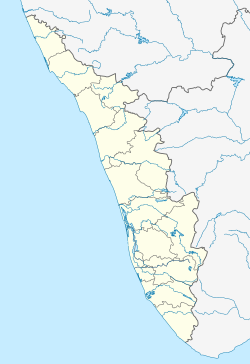 Meppadi is a town in the South Indian state of Kerala. It is an extremely scenic hill station on the State Highway between Kozhikode and Ooty. The nearest city is Kalpetta which is the headquarters of the Wayanad revenue district. Tea cultivation is the main economic activity of Meppadi village. There are also some vegetable cultivation on small scale. Most of the people living in Meppadi are workers in various tea estates. There is a small town catering to locals and the tourists. The tourists come to enjoy the salubrious climate of the place. Meppadi is 12 km from Kalpetta town in the Wayanad District. It is 78 km from Kozhikode (Calicut), 106 km from Ooty, and 281 km from Bangalore. Wikimedia Commons has media related to Meppadi. Wikivoyage has a travel guide for Meppadi. This article related to a location in Wayanad district, Kerala, India is a stub. You can help Wikipedia by expanding it.